Performances in the Flight Theater at The Complex during the Hollywood Fringe Festival. “No man chases evil because it is evil; he only mistakes it for happiness, the good he seeks” –Mary Shelley. Sometimes the things we fear are not always the creatures that go bump in the night. 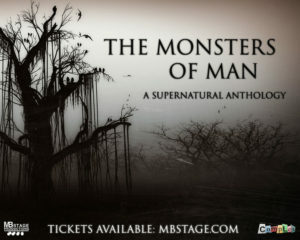 The Monsters of Man: A Supernatural Anthology combines an element of the everyday with a splash of the supernatural. A 9 scene journey through the stories and lives of individuals who will show that sometimes the most terrifying monsters of all are the ones we create ourselves. Mel Glickman (co-director) is an actor, writer, and fight choreographer from Baltimore, MD and trained by NYU Tisch’s Experimental Theatre Wing. Mel’s directing credits span over the past 8 years with New York’s Fight Theatre and Baltimore’s Spotlighters Theatre and Cohesion Theatre Company. They are a production team member for MB Stage Productions. Cooper Knight (co-director), is an AMDA Alumni, LA-based performer and writer. They’re excited and humbled to be here on their second ever real-world adventure into the world of directing, after years of theater experience. Sarah Ruttan (co-director/writer/producer) Has worked with MBStage Productions for over four years, (first as an actor, then as part of the production team) Sarah is excited to drive headfirst into her first ever roles as Writer/Co-Director/Producer of The Monsters of Man. A graduate of AMDA: The American Musical and Dramatic Academy, Sarah has spent the last five years learning all she can about every aspect of the industry. And for a small town girl coming to the big world, she’s happy to say she’s had a blast doing so. She hopes above all else that you enjoy her writing debut with The Monsters of Man: A Supernatural Anthology.